Where do you rest your weary head? An unsettled mind will wake you up in the middle of the night. What do you do then? Get up? Stare at the ceiling? Go to another room? Read? Turn on the computer and abandon hope of any decent rest? I know, you are thinking, all of the above. Have any significant contributions been made to the science of sleep? Yes. My uncle, the late Dr. Hugh Smythe and his friend, Robert F. Clark, created the shaped pillow. 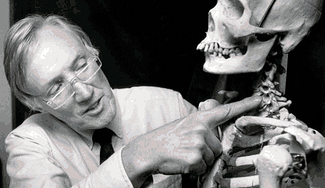 Dr. Smythe used his knowledge of medicine to study how mankind has dealt with sleep through the ages. With his electric carving knife and some foam padding he went to work to invent a better pillow. Do you toss and turn and punch your pillow? Do yourself a favor and get a new one that supports your head and neck. As writers we cannot afford to block any ideas that may flow in the night. You will not be sorry, I promise you. When writing My American Eden, I took a trip to Plymouth to see what how colonials lived in the mid 1600’s. Floored by the short beds, I asked the guide, sitting at her spinning wheel, to explain why people did not lie flat. Pneumonia, the old man’s friend, was the answer. Fearing death in the night had weary farmers sitting up. Noting the pillow, as was my training from my uncle, I saw that they used round and quite firm bolsters. The sheets were made of linen, hence where we get the term bed-linens, and it looked altogether Spartan to my jaundiced eye. The expression, sleep on it, has always made good sense to me. Our brains are over-stimulated, and that condition gets worse by the minute. Sleep specialists always advise not to watch television as an aide to insomnia, as it only makes the condition worse. A long walk, in the fresh air, followed by a healthy diet, during the day, restricting processed foods and refined sugar, dining early, and other good habits really do help. Yet so many nights I am wide awake at an ungodly hour. Warm milk with turmeric and cinnamon, a tip I learned from watching Dr. Oz works wonders. Years ago, I used to refrain from getting up and would lie in bed driving myself crazy running through a litany or worries. Now I get up and read until my eyes are tired, or I listen to sleep tapes I found on YouTube. If I find that I am at a loss for words during the day, and thus am awake and trying to sort out whether a chapter in my novel should stay or get the ax, I often find the answer in the morning. Stephen King was on a vacation in London when he he awoke in the morning with a story in his head. He told his wife he had to write, asked the hotel manager to set him up with a desk and wrote Carrie. The rest is history. Nothing changed my sleep problem as significantly as a visit to this website: www.shapeofsleep.com. Having purchased memory foam shaped pillows in department stores I have long been sold on this concept, but the real deal is much much better. This entry was posted in Uncategorized on December 28, 2014 by Elizabeth Smythe Brinton. Many great accounts filtered down to me regarding Daniel James Brown’s account of Boys in the Boat. When a book is recommended that highly, it rarely disappoints. That goes double for this amazing re-telling of the 1936 Berlin Olympics and the lads from Washington. One of the members of the Best Food Ever Book Cub, posed this interesting question: “What made the boat speed through the water faster than any other boat? Coaching? Pocock’s design and cedar cut from the B.C. coast? Determination, competitiveness, and will? The Fates?” These are all great questions, and I know the discussion will be very lively as we look for answers. It is my personal belief that champions are born, and champions are also made. What kept me turning the pages of this book that topped the New York Times bestseller list, is the recreation of a time and a place. A quest plot drives the action as we are literally pulling for every member of the crew. From hard working circumstances and the depths of the depression, these young men prepare to make themselves champions. The coaching is superb. There are words of inspiration for us to read and tuck away in our minds, on our blackboards, and in our diaries. Reading of all the various obstacles overcome by the crew members, the grueling conditions in which they trained, the brute strength they were able to call upon when needed, makes this book an inspiring read. How I wished I had a rowing machine in my basement, or that I could get out on those glassy early mornings in my kayak or my canoe once again. I longed to feel my back muscles stinging, and I wanted to watch whirlpools in the water. I longed to glide along driven by my own steam. There is something so satisfying and immediate about the whole mode of travel that I wanted to feel all that beauty again. Certainly the boys from Washington had an inner toughness that we long to see again. I can remember that in my youth the hockey players who worked in gravel pits and on farms in Ontario, gaining strength while putting food on the table for their families. Can true grit be found in a gym? I am sure it can, but I have always wondered if overcoming adversity as a child adds to what goes into the making of a champion. 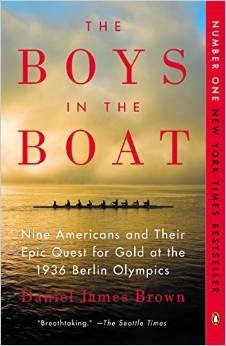 If you have a reader on your Christmas list, or like me, you give books to everyone, Boys in the Boat will be a highly valued addition to any library. This entry was posted in Uncategorized on December 8, 2014 by Elizabeth Smythe Brinton.